Whenever friends or family visit Victoria and want to experience the rugged west coast but only have a day while on Vancouver Island, a drive to Port Renfrew is the place I take them! Along the route are sandy beaches, panoramic mountains and ocean views, sea lion caves, tidal pools, surfing, hiking trails and a variety of places to dine. The route from Victoria downtown follows Highway 1 to Exit 10 (View Royal /Colwood) onto 1A that becomes Highway 14 to Port Renfrew. Highway 14 is paved to Port Renfrew and if you don’t stop it’s a four-hour return trip. Traffic is light on this highway so enjoy the drive. 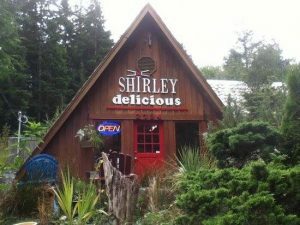 Along the Highway 14 route to Port Renfrew are many places to explore – it would take days to see them all. I’ll suggest a few must stops along the way and other places you may want to consider!! First stop for me is Serious Coffee located just past the traffic circle on the left in Sooke. My favorite is the granola bar and lunch sandwiches which are available to go. There are a number of other options for food/beverages in Sooke. Before you depart from Serious Coffee in Sooke set the trip odometer!! At Muir Creek , just 13 kilometers from Sooke, there is easy access to the ocean. Turn left at the bridge into the parking lot. A flat easy access trail leads to Muir Beach. Sheringham Point Lighthouse, a Canadian Heritage Lighthouse, is 18 kilometres from Sooke. The access road is between the Fire Hall and Shirley Delicious. Turn left on Sheringham Point Road and proceed 1 km to the parking lot on the right side where there is a short trail to the lighthouse. The site is open to the public daily from 9 am to 8 pm. Caution is recommended as the shore is exposed to high winds and rogue waves. For lunch or dinner we often take firewood for a favorite meal of hot dogs roasted over the open fire at French Beach Provincial Park – just 3 kilometers past the Sheringham Point Road. There are fire pits beach side. Ocean access to French Beach is an easy walk just a couple of minutes from the parking lot. Enjoy the beach walk and keep an eye to the ocean for whales and sea otters, and bald eagles perched tree top. 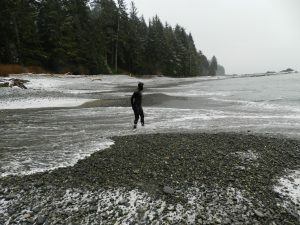 At Kilometer 28 from Sooke is Sand Cut beach. The parking lot is on the left adjacent to the highway. The hike down is about 15 minutes through forest with boardwalks and stairs to the beach. Past Sand Cut beach parking lot, the highway dips down to the ocean through Jordan River. Cold Shoulder Cafe is a few hundred metres from Jordan River Regional Park just past the bridge. It’s on the corner where the highway makes a sharp right turn. Continuing on Highway 14 to Port Renfrew, the next stop is Juan de Fuca Provincial Park. The park has four main areas: China Beach day use, China Beach Campground, the Juan de Fuca Marine Trail and Botanical Beach. Originally the trail was a lifesaving link from the graveyard of the Pacific that saw many shipwrecks along this coastal area. China Beach day use and campground is at Kilometer 35 from Sooke. The trail to China Beach starts at the end of the parking lot to the left of the entrance road. Although a bit of steep walk down it’s about 15 minutes along a wide and well maintained path to the beach. Enjoy the Sitka spruce, Douglas fir and cedar trees along the trail and when walking the beach watch for seals, sea lions and whales. This park is also a trail head for the Juan De Fuca Marine Trail that extends 47 kilometres to Port Renfrew. For a stunning panoramic view of the Olympic Mountains in Washington State and Juan de Fuca Strait, take the North Main logging road right across from the entrance to China Beach day use. Proceed carefully up this active logging road for 2.2 kilometers and turn off the main road for about 100 meters. Although narrow there is sufficient space to turn around and return to Highway 14. Enjoy the views high above the water! Return down the logging road and turn right to Port Renfrew. Continuing along Highway 14 to Port Renfrew at Kilometer 59 from Sooke is the turnoff to Sombrio Beach. This cobbled beach is popular for winter surfing and wilderness camping adjacent to the beach. If visiting during the winter a 4-wheel-drive vehicle might be required but most of the time the access road to the parking lot is accessible by car. Proceed back to Highway 14, turn left and enjoy the short drive to Port Renfrew. 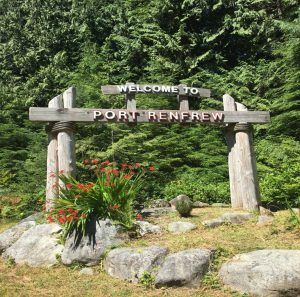 If it’s summertime, and the flowers are blooming under the Welcome to Port Renfrew sign, stop as the humming birds may be feeding!! Continue driving on Highway 14 as it takes you through Port Renfrew to Botanical Beach parking lot. There is a coastal hiking trail along Botanical Beach that is the terminus of the Juan de Fuca Trail. The trail provides access to rugged beaches with geological rock features, and at low tide there are many rich tidal pools and kelp beds to view marine life. Explore the tidal area and see pools filled with brilliantly colored marine life. But remember to just view the marine life and avoid touching the water in these sensitive ecosystem pools. Sea urchins, barnacles, mussels, anemones and sea cucumbers are just some of the thriving intertidal life. I suggest “Seashore of British Columbia Guide” to identify mammals, fish, anemones, cucumbers, crabs and many other species. If you want to experience viewing at its best visit Botanical Beach during low tide. I suggest checking the tide table for Port Renfrew. It’s best to arrive at the Park at least 1 hour before low tide. The time of the low tide will obviously determine when you have to depart. Please keep in mind when exploring the beaches and pools to be aware of wave activity and increasing water levels should the tide start coming in while you are exploring!! So take your lunch with you and find a spot on the beach. If you didn’t bring a lunch then enjoy some of the food offerings in Renfrew. I like Bridgeman’s West Coast Eatery located on the dock at Pacific Gateway Marina. Other activities include kayaking and salt water fishing. Enjoy the rugged west coast drive. Also, check out the Pacific Marine Circle Tour. For places to camp on Vancouver Island and elsewhere in British Columbia go to Camping & RVing BC Camping Map. 1 thoughts on "Sooke to Port Renfrew: A Day Tour to Experience the Rugged Pacific Coast on Vancouver Island, BC"
Thank you for this helpful guide – It’s just what we needed! !